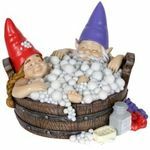 At GardenFun, we carry more than your typical garden gnome. 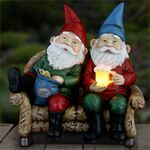 While we love these classic red-hatted figures, we wanted to offer upgraded solar gnome garden lights that will brighten your garden or pathway. Our solar gnomes are fun and unique. 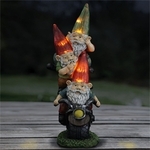 You will be the envy of your neighborhood with these bright nightlight gnomes! 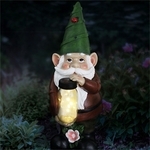 Each solar gnome garden light will illuminate the night without needing any outlets or power cords. Their embedded solar panels store energy while the sun is out and then automatically turn on in the evening. 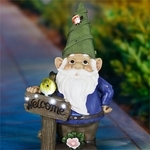 Line your front or back pathways with these 13-inch styles or transform your garden into a twinkling gnome wonderland with our adorable illuminated scene statues. 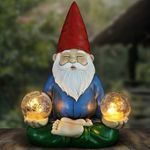 Our classic solar powered gnome sitters include Zelda, Mordecai, Rumple and Merlin, adding familiar faces to any backyard landscape. These cute 13-inch styles can perch on a rock ledge, on the edge of your porch, or even on a bench in your yard. 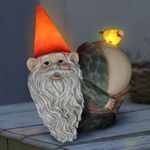 Our solar gnomes look magical when illuminated. Children and adults alike will love these GardenFun favorites. 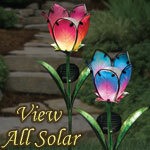 In addition to our sitting gnomes, try our other solar options. 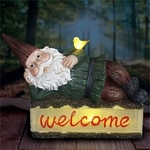 The hiking solar powered gnome statue has an illuminated lantern, perfect to nestle into your garden area. Our fiddler solar gnome statue is truly one of a kind. Each fiddler comes with an audience of frogs and a bright mystical globe that lights up automatically in the dark. 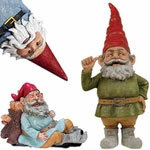 Add our checkers-playing gnomes to your collection. This design is always a conversation starter. Watch two friendly gnomes as they prepare for their next move in mushroom checkers. Each mushroom checker piece will illuminate in the dark to light up their game and your backyard. 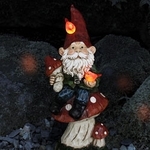 All of our solar gnome garden lights are crafted from a durable and weather-resistant resin that will withstand the elements and keep your yard looking fresh.These accessories will give your landscaping a welcoming look that will impress your visitors. 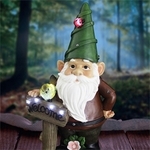 Find solar-powered gnomes, star-studded gnomes and more at GardenFun.com!